Introducing one of the most popular and downloaded texture packs for Minecraft, as such as one of the first to be available for the new version 1.7.2 of Minecraft. 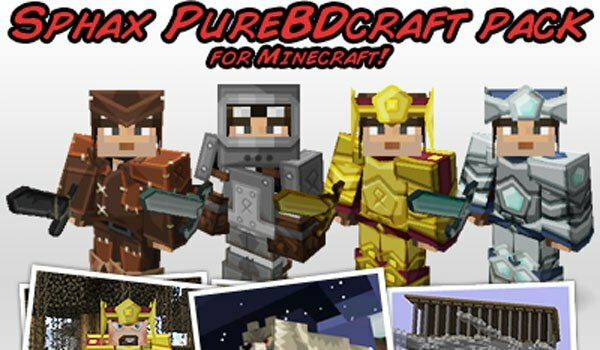 Its called PureBDCraft Sphax 1.10 and 1.9 and is a texture pack offered in various resolutions, such as, 16x, 32x, 64x, 128x, 256x and even 512x. Seeking a balance between resolution and quality, we show you the 64x resolution pack. The reflective water that you see in the picture isn’t part of this texture pack. ¿How to install Sphax PureBDCraft Texture Pack for Minecraft 1.10 and 1.9? Paste the .zip download file into: “resourcepacks”.